Christopher Busietta - What makes a great opera singer? 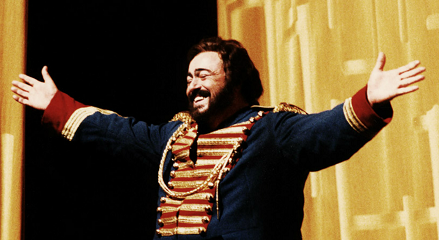 Luciano Pavarotti in The Daughter of the Regiment (La Fille du Regiment). The Bavarian opera houses began rehearsing for the new season last week and, in my case, I am trying to remember how to sing after an unprecedented five week break. When I focus on my goals for the year, usually regarding what aspects of my performance I wish to improve, I often look to my idols (as well as my colleagues) and reflect on what I feel they do better than myself. As a young student and even a young professional singer, you are always comparing yourself to the people around you – what is it about this particular singer that makes them better or worse than you are? Regardless of whether you are looking at a soprano, or a basso profundo, what can I take from their performance to improve my own? This is what you are born with, the raw talent of the opera singer and the singer in general. The actual size and beauty of the persons voice. That said, there are many different types of opera singer. You don’t have to have the biggest voice in the world nor the most beautiful voice in the world. But having the better lump of coal in your throat there to begin with will be what separates you from being a very good singer, or the potential to be one of the greats after many, many years of training.  It is difficult to judge how good your lump of coal is until you have several years of training behind you and the qualities that appear will continue to surprise you. I would not have dreamed of what my voice is capable of now from when I started as the quality is often hidden by lack of technique. 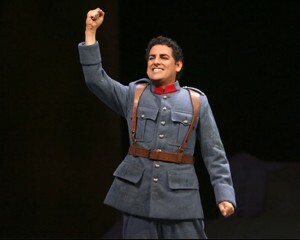 Juan Diego Florez in The Daughter of the Regiment (La Fille du Regiment). 1. The ability to make a beautiful, even sound in the full range of our voices (usually two octaves, sometimes more). This means your high notes do not sound shrill or thin, the middle range is free and open and the bottom is not breathy. 2. to do it in a way that is not going to hurt your throat and allow you to sing all night. This is what turns a good lump of coal into a sparkling diamond. Quality of voice is nothing without technique in opera. You can get by quite nicely in many types of music with your lump of coal, but without years of work you cannot sing opera with the power, flexibility, vocal stamina, dynamic control and beauty that it needs. Cecilia Bartoli as Cinderella (Cenerentola). Opera is a very complicated musical form. Sure, many of the beautiful arias may be hummable, but throw in sixty orchestral players, forty men and women in the chorus, and other soloists singing and playing different musical parts around you and then you realise you need to know a lot about music to survive all this confusion. Despite all the stories that go around about famous singers who never learnt to read music, singing anything without having looked at the score simply doesn’t work, especially when things go wrong on stage – which they will. In these situations, you need to know more than what you are singing. Every skill that you learn in a conservatorium: language (to understand what you are singing about and also so you don't need someone to teach you how to pronounce EVERYTHING), sight reading (learning your melody correctly and following the other parts), rhythm reading (for those tricky sections), chord recognition (so you can pitch your notes), scales, modes, harmony, voice leading, choral singing, music history and musical style are vital to any opera role you take on. There were lots of people in my class in the conservatorium who slept through music history, who didn’t work hard on their aural skills or thought music theory was just there for credit. A lot of the people who played around in language class had no real interest in classical singing, despite being enrolled in classical voice. None of these people are professional musicians. 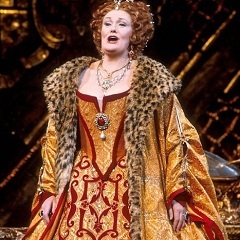 Acting is the traditionally neglected skill for opera singers to study. But this is what seperates a singer from a music theatre performer who represents characters on stage. This actually affects singing. You can learn to control your voice so that you can sing everything the music asks for - nice consistent legato, correct dynamics and phrasing, accents where they are written. But if you don't know how to color and interpret the words so that your fortissimo sounds (and looks) overjoyed, angry, scared or painful, you really turn into a singing robot. If you want a positive role model for how to sing dramatically and moving text, look no further than Luciano Pavarotti sing Il Trovatore or Giuseppe di Stefano and Maria Callas singing their breath-taking i Pagliacci performances. Are you good at knowing the subtleties of your text and your character and therefore make proper sense of all the text you have to sing and react to? Do you sing your words but not listen to other characters on stage? Then there is physical acting. Can you sing while moving, crouching or lying on stage or can you only sing in a straight, standing position? Do you look comfortable on stage? Do all your movements look natural? Do you move or gesture unnecessarily? Are your reactions believable? Then are your actions consistent with your character's personality? For this, you don't need to look at opera singers, but the great actors on stage and screen. Laurence Ollivier, Ian McKellan and great film actors like Al Pacino, Dustin Hoffmann (heck even Tom Cruise and Leonardo di Caprio), Meryl Streep, Judi Dench and Kathy Bates do amazing subtle things with their face and body. And listen to the way they talk - that gives you so many clues about how you can use your voice in opera (not to mention how to deliver dialogue in Singspiel and Operettas!). When do they raise their voices? Which words are emphasised? How fast or slow do they speak their lines? Where do they pitch their voice? The best opera composers like Mozart, Verdi and Puccini use pitch and rhythm for their characters so well in their music that often it's the biggest clue for dramatic interpretation. But you still need to know how to speak it convincingly. 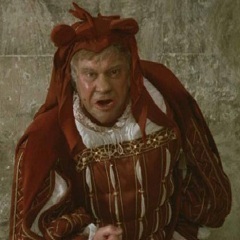 Rigoletto film version (1982) directed by Jean-Pierre Ponnelle. Experience is something I surprisingly underestimated. Then I noticed that after two years with OzOpera schools company doing sometimes 3 performances in a day, singing constantly in eisteddfods and oratorios with orchestras and conductors that I really improved as a singer and a performer. But these were generally small halls. Going into a 1200 seat theatre as a full-time singer, through the 70-80 performances a year and six days a week of rehearsals for the last three years in a theatre, I learnt something you could not learn in the smaller venues. I learnt how to really follow a conductor as a solo singer. I realised how much more focussed and projected my sound had to be and began to sing accordingly – my mezzoforte sound became my "theater" piano sound. I noticed when I started having vocal problems that I had couldn’t oversing – my fff sound didn’t actually project in a theatre and only hurt my throat. 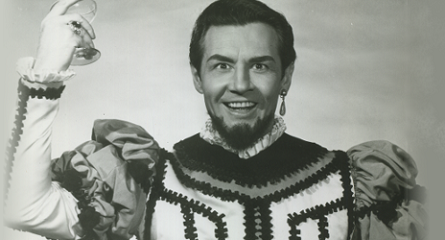 Cesare Siepi as Don Giovanni. To sit in the theatre rehearsals and hear what the balance between singer and orchestra was like – where did it sound good? Do I need to come forward for certain phrases? How soft can I sing? Am I matching what I'm hearing from the orchestra and the other singers? To be on stage and figure out what to do when a colleague drops a prop or forgets their text. And learning roles are so much easier when you are rehearsing with other people. How often have you studied and studied a role and you are still confused with why your character says something or how s/he is feeling? So much personal misunderstanding about text and character gets cleared up just by getting on the stage and rehearsing a scene with other actors and a director. Not only are you seeing how your instincts play out, you see the other actors reactions (if they are good) and you get feedback from a director. This is one big difference from having the experience of rehearsing and performing a role, and just having studied it privately. The only way to know these things to be a great opera singer is to get out there and do it - so don't be afraid of auditioning (that is a skill you learn from experience as well!) and getting out on the stage too early! Leaving it too late can put you at a great disadvantage. The earlier you get out there, the quicker you will learn. And that goes for every single skill that I have mentioned. 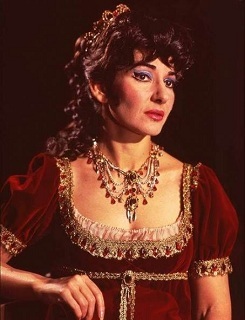 So get out there, do your auditions now and one day I hope the world are full of singers who have the voice and technique of Joan Sutherland, the musical knowledge of Riccardo Muti, the acting ability of Sir Ian McKellan and who started doing it in their twenties! 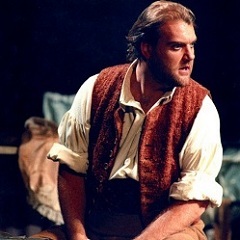 Bryn Terfel as Figaro in The Marriage of Figaro (Le Nozze di Figaro). Photography: Robert Cahen. 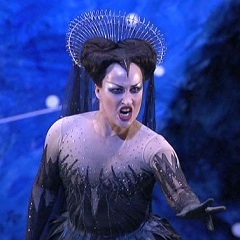 Diana Damrau as Queen of the Night in The Magic Flute (Die Zauberflöte). 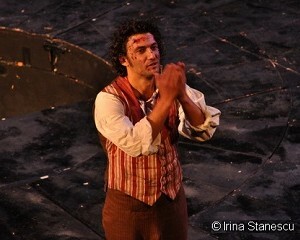 Jonas Kaufmann as Cavaradossi in Tosca. Royal Opera House, 2011. Natalie Dessay as The Bride of Lammermoor (Lucia di Lammermoor).